The genus Amphion has 1 species in the USA. It is a monotypic genus. General Information: This is a small moth. The forewings are brown with a distinct black band. The margin of the forewing is lined with white and is slightly curvy. 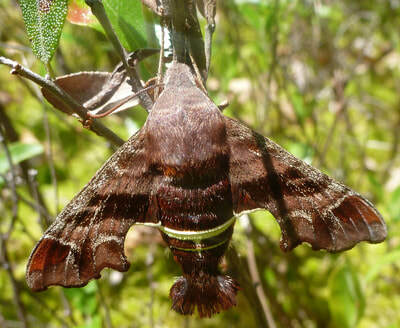 The hindwings are black and red with a white fringe. The body of the moth has 2 very distinct cream lines between the last two segments. The tip of the abdomen has several lobes of scale tufts.